I wondered recently whether anyone has ever gotten both a 2400 (perfect) SAT score and a 2400 (not perfect, but pretty darn good) chess rating. This isn’t the same thing exactly, but I ran across an interesting discussion at reddit.com: Would you rather have a 2400 chess rating or a 2400 SAT score? Before I tell you the results, some explanation for non-U.S. readers: the SAT (Scholastic Aptitude Test) is a test that most college-bound students take. It traditionally had two parts (mathematics and verbal), each with a maximum score of 800, for a total of 1600. In 2005, the verbal test was split into Critical Reading and Writing, each with 800 points, so that the maximum score possible went up to 2400. Apparently this change has not been all that popular, and they are going to return to the 1600-point system in 2016. So there will be only an eleven-year window of history when it will be possible to score both 2400 on the SAT and have a 2400 chess rating. The SAT was useful for all five of the seconds that it helped me get into college, and I don’t feel that it is characteristic of some huge amount of intelligence. All it says is that I’m good at taking tests. I’d go with the 2400 SAT if it meant I was actually smart enough to do it legit. A perfect score [on the SAT] … has little indication of your mental capacity. A 2400 chess rating, on the other hand, indicates a level of logical deduction and concentration of the highest order. SAT tutors make more money than pro chess players … I’d go with SAT just cause I’m not big on traveling. Chess. … It’s nice to be ludicrously good at something. SAT scores don’t mean a damn thing for more than a month of your life. Now, a 2400 chess rating, on the other hand can be parlayed into some interesting life experiences. What does your faithful blogger think? Well, there was a time in my life when the SAT was very important to me, but basically for one reason only: I had to get a higher score than my sister. I did, so I was happy. But aside from that, the SAT has not meant anything to me. Its only value is getting you into the college or university of your choice, but you know what? Even that isn’t as important as people make it out to be. If you care about your education, you can get just as good an education even at a less prestigious school. Education is not something that the college or university hands to you; it’s something that you earn and create for yourself. Nevertheless, I would consider the 2400 chess rating to be the greater life accomplishment. I’m with the guy who said, “It’s nice to be ludicrously good at something.” But I’d say it’s more about creating something. When you get a 2400 SAT score, you are ludicrously good at taking tests, but you haven’t created anything. You have only answered a bunch of questions the way that somebody else thinks you should answer them. But to get a 2400 rating at chess, you have to bring something unique and individual to it. You have to create. P.S. Today the US Chess Federation announced the winners of the 2015 Scholar Chessplayer Awards, which come with a $1500 scholarship. (Alas, not $2400.) Two of this year’s winners in fact got 2400 scores on their SAT’s: Simone Liao (2400 SAT, 2203 USCF) from California and Rachel Gologorsky (2400 SAT, 2112 USCF) from Florida. You can say what you want about SAT’s being meaningless or chess ratings being meaningless, but to me both of these kids have accomplished something amazing. I can predict with a high degree of confidence that they will accomplish further remarkable things in their lives. Congratulations, Simone and Rachel! Too bad no statistics on these questions. I did read that last December there were 300 perfect SAT scores out of 1.6 million who took the test which is about 0.019%. For comparison I located a distribution of USCF ratings (as of 7/31/14). A total of ~41000 active players and roughly 300-400 rated above 2400. Thus, about 52 times higher ratio than perfect SAT scores. Despite this I would still take the 2400 chess rating over SAT 2400. I think that there’s a strong selection effect in the USCF ratings. Every college-bound or -aspiring student has to take the SAT (or the ACT, but let’s ignore that for the moment). So in SAT scores you get pretty much the whole spectrum of intelligence, perhaps excluding really impaired people. However, USCF chess players are a self-selected group. In my opinion, the top 1 percentile in the USCF corresponds to the top .01 percentile (or less) in *current chess ability* in the population as a whole. Whether it corresponds to the top .01 percentile in chess *aptitude* is a tougher question. 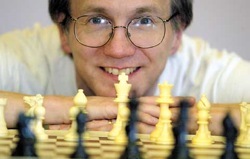 Stephen Jones, a 2400+ rated friend who spent time doing math at the Institute for Advanced Studies (before going back to school to become a successful attorney), wrote a wonderful piece entitled “Momma, Don’t Let Your Sons Grow Up To Be Grandmasters” seven or eight years ago, and another relating that chess masters dominated the list of ten most brilliant people he knew, but not the list of ten most successful people he knew. Perhaps you would like to obtain his permission to share these on your blog, as followup to this wonderful post?! SAT doesn’t necessarily represent students’ abilities fairly. The same goes for rating in chess. What is more important is player’s creativity, imagination, and tendency to risk (“Creativity takes courage,” Henri Matisse), against mere pursue for points. Michael Aigner pointed out on Facebook that Steven Zierk is in fact an example of someone who has done both: 2400 SAT and currently 2562 (his lifetime high) USCF. I think Steven will probably retire the title for maximum combined SAT/USCF, because after next year 2400 SATs won’t be possible any more. Previous post: When is Forfeiting a Game Justified? Next post: Introducing Daisy Sue!